Working 1 disc at a time, roll out dough between two sheets of plastic wrap until inch thick. Using round fluted cookie cutters, cut out shapes (re-rolling and cutting dough scraps as needed). 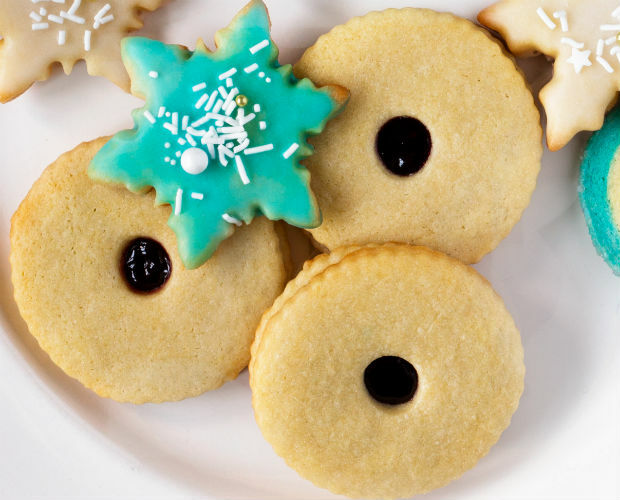 Using a small, circular cookie cutter, cut peephole out of centre of half the cookies. Place cookies 1 inch apart, on large, parchment paper-lined baking sheets. Refrigerate until firm, about 20 minutes. Meanwhile, preheat oven to 350°F. When cookies are done chilling, transfer to oven and bake, rotating pans halfway through, until bottoms are golden, 8-10 minutes. Allow to cool completely on racks before filling. In small bowl, whisk desired jam until smooth. Spread 1 scant tsp of jam over bottoms of each whole cookie, leaving 1⁄4 inch border along edges. Sandwich with cut-out cookies, flat sides down, pressing to adhere.